According to an article published by the Chalmers University of Technology’s Division of Water Environment Technology, 35% of water entering a water treatment plant is inflow and infiltration, another 35% is storm water, and the remaining 30% is sewage. In other words, 70% of total flow into a treatment facility is water that would not need treatment had it not entered a sewer line. It robs valuable capacity from treatment plants, and such capacity shortfalls can lead to damaging and costly sanitary sewer overflows (SSOs). The impact of I&I is even greater in some regions. A recent study of all municipal sewer systems in Tennessee shows that I&I represents approximately 104,720 million gallons per year. This accounts for 45% of the annual flow to treatment plants. Processing this extra water is estimated to cost at least $188 million annually statewide. This figure is conservative compared to the EPA’s 2014 estimate of $2 to $5 per thousand gallons− which would raise the cost to between $208 million and $522 million. 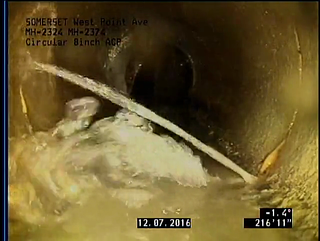 Sources of I&I include leaky manholes, lateral connections and sewer mains. Yet, a majority of rehabilitation efforts focus solely on sewer mains. In a white paper entitled “Working Smarter Against I&I”, we discuss the total system approach to combating I&I and the tools available to evaluate the different elements of your sewer system. With concepts presented in this paper you’ll also be ready to develop a plan to cut I&I by up to half.